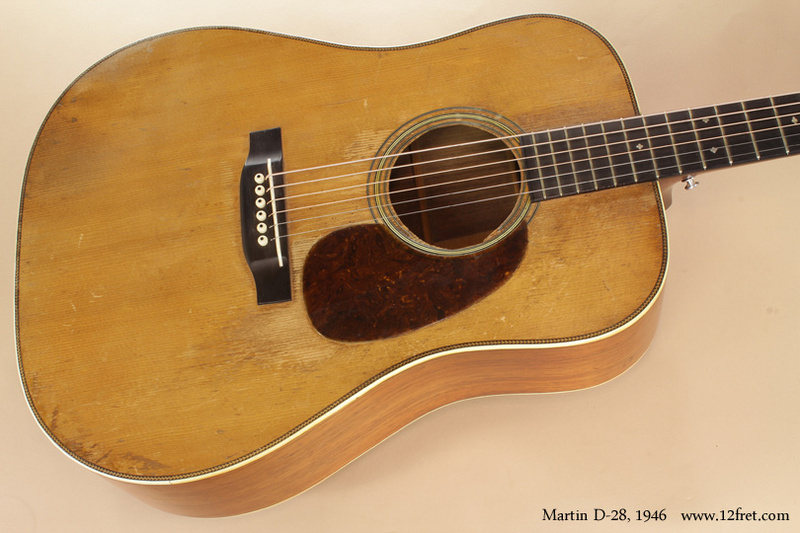 Comments Here is a rare, old classic – a 1946 Martin D-28. This fine instrument has been played, and looks and sounds it! 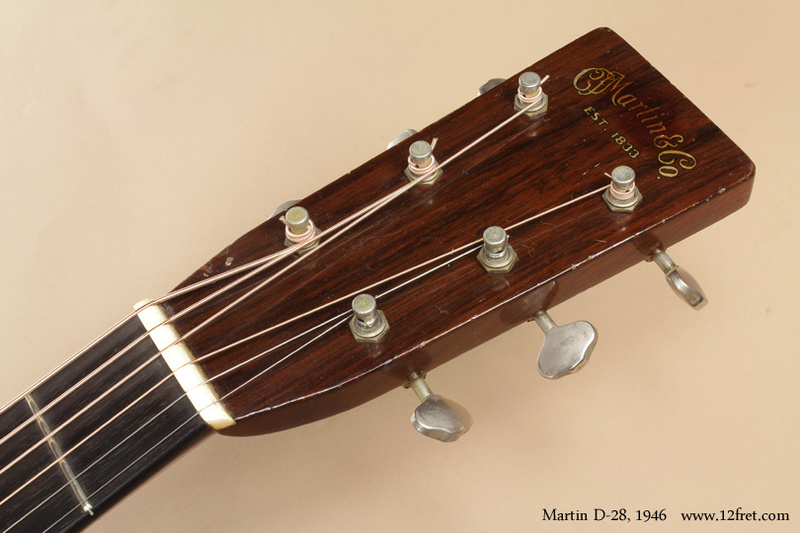 The Martin guitar company introduced the ‘D’ Dreadnought size body in 1916, but not as Martin products – they were made for the Oliver Ditson company, until Ditson folded in the late 1920’s. The first Martin-branded Dreadnoughts appeared in 1931 as the mahogany-bodied D-1 (this became the D-18) and the rosewood-bodied D-2 (this became the the D-28). 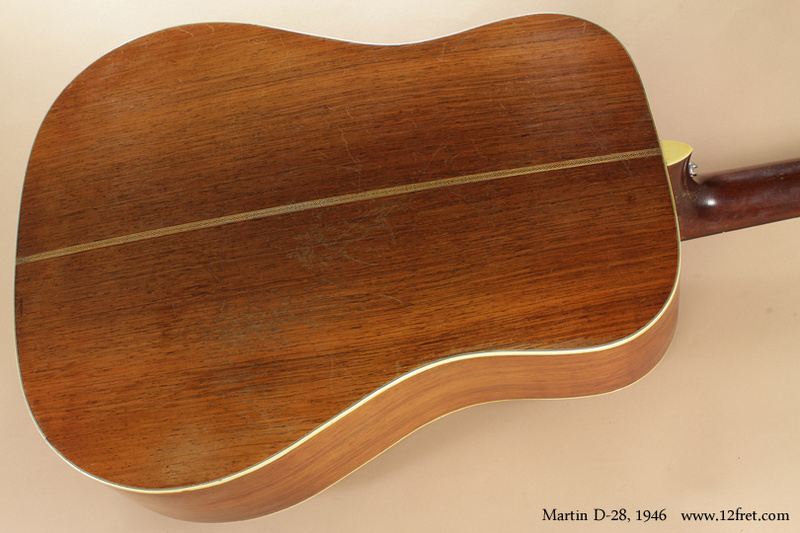 This 1946 Martin D-28 example has what was a standard feature – herringbone purfling and back strip – and this feature ended in 1947. The herringbone material had been sourced in pre-war Germany, and there was no US replacement supplier; so when Martin ran out in 1947, that was it for herringbone. 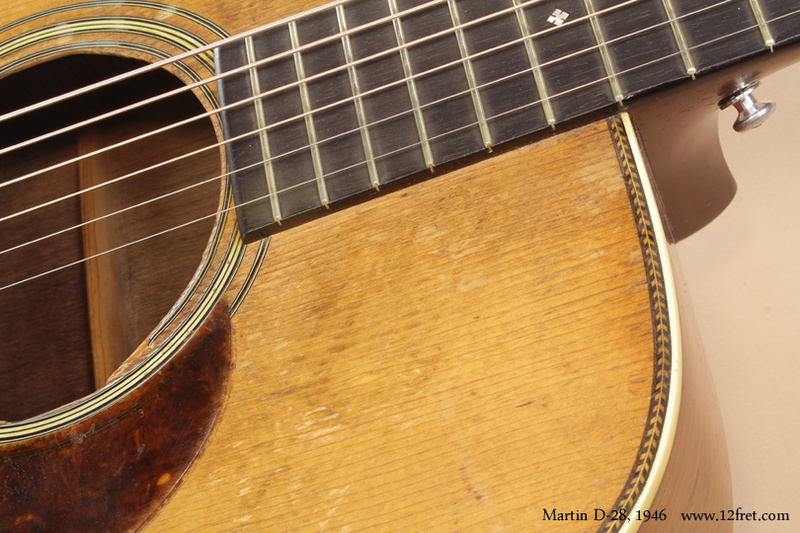 To 1944, Martin D-28s had light, scalloped braces reminiscent of the light and responsive Ditson instruments. However, strings started getting heavier and heavier, and this posed structural problems. 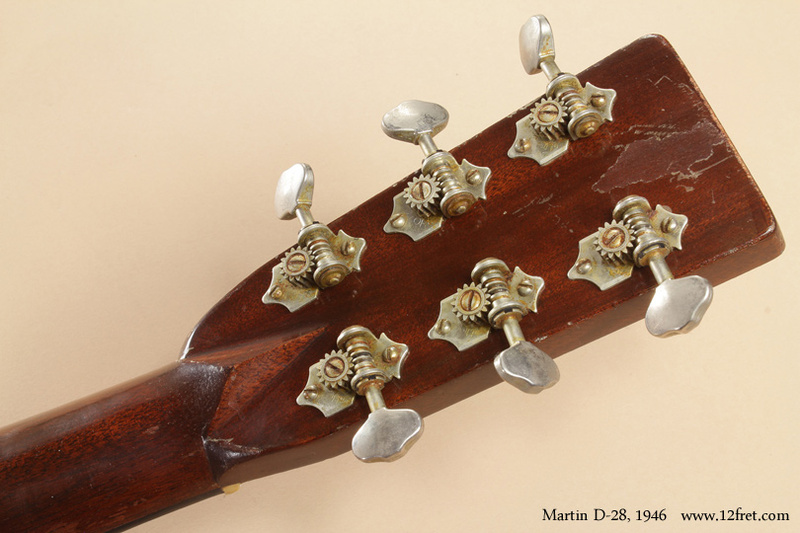 In 1944, the top bracing was made stronger to withstand the extra tension rather than make the whole guitar heavier. This instrument has been played, a lot. It feels and sounds great with a full range, crisp tone. Serial Number 95051, built during 1946 at the Martin plant in Nazareth, Pennsylvania. Neck Mahogany neck with unbound, likely replaced, ebony fingerboard; snowflake markers. Definite V-profile. Frets Moderate play wear, particularly in the lower positions. Body Classic Martin D-style body in the ’28’ herringbone style – spruce top, Brazilian Rosewood back and sides, newer ebony bridge and maple bridge plate. Finish Nitrocellulose lacquer finish with lots of wear, particularly on the top. Hardware/electronics Bone nut and saddle, replacement Gotoh gears in the style of the original Waverly tuners – they fit perfectly. Playability/Action Plays quite well at a standard action height.